I've decided to be charitable and give three handmade skirts a second chance - I'll be shortening them and/or fiddling with their waistbands. But if they still don't impress me they'll be flung out too. I'll let you know the outcome of that experiment in a couple of days time i.e. when I can be arsed to alter them. A few items just look plain tatty and have been shown the door, whereas others are lovely garments made with decent fabric - they're just never going to be worn again. So I've decided to give this last category of garments away - if any sewists out there like the look of the items listed below, I'll happily post them out free of charge to a good home! In the interests of being fair - it's just one item per person, so please leave a comment by midnight GMT on Tuesday 30th April if you've got your eye on anything. If more than one person likes a particular item I'll draw names out of a hat, and if an item isn't commented on, it's going to the charity shop on Wednesday. I've given fabric and size details and anything else I can remember. Please also be aware that some items were made right at the start of my sewing life so may not be the prettiest of sights on the inside…. Made from medium-weight Kaffe Fassett quilting cotton. Colette size 8 with the tucks increased for a more fitted look. Self covered buttons down the back. Worn twice. Made from Denyse Schmidt lighter weight quilting cotton. Size medium (pattern sizes here) with no modifications. Looser fit so can be worn with a belt. Worn a lot. Made from Ikea floral linen. Colette size 8 and probably taken in a bit at the sides. Worn a few times. Made with Anna Maria Horner voile (gorgeous fabric). Sewaholic size 10 bust with a small hip adjustment (PDF of pattern sizes here). I never seemed to be able to get this blouse right. It started life sleeveless and I've added sleeves at a later date (these can easily be removed though). 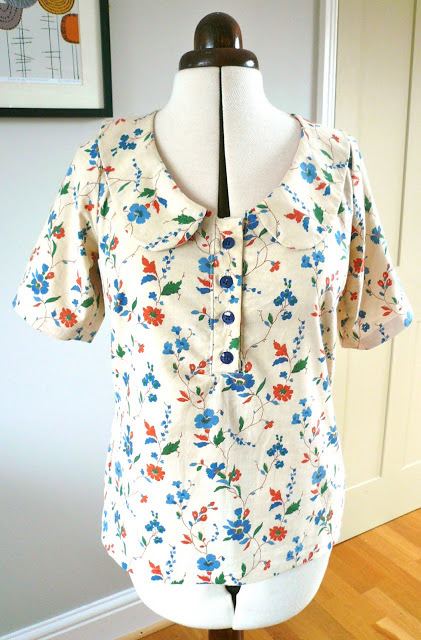 It also has a Peter Pan collar, not very expertly added, again, this can easily be removed. Worn twice. Made from vintage curtains (!) and vintage buttons. Megan Nielsen size small. The placket has been inserted upside down but you can't really notice! Worn a few times. 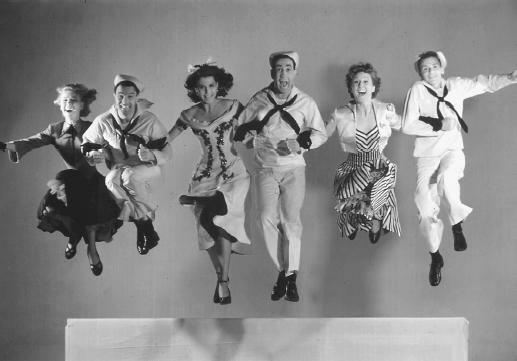 You may be asking yourself why the cast of On the Town (one of my favourite films) are jumping for joy? Because it's my birthday of course! I haven't really been paying attention for a couple of years and now I appear to be 44!! How the hell did that happen?! 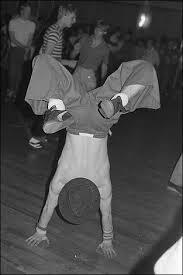 Moving swiftly on… the SUN IS SHINING in the UK!! Yes, it really is! After a gruesomely glum winter, spring looks like it's finally here. 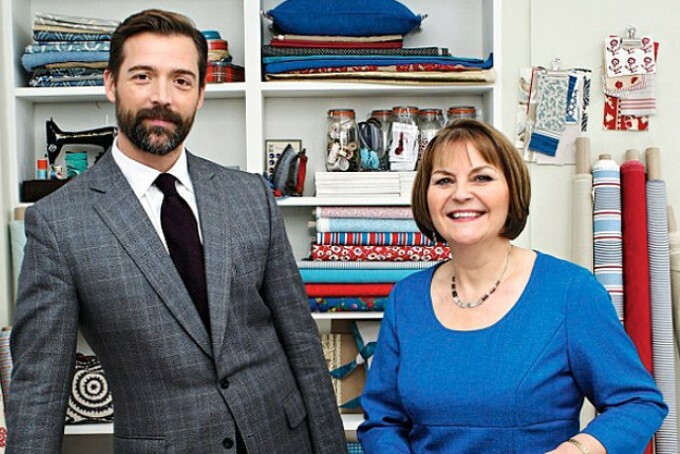 I intend to have a fab day: lunch with my husband and then an extra special viewing of the Great British Sewing Bee final tonight! Plus, I have the added high of knowing I managed to snaffle this wonderful pattern in the swap at Saturday's epic meet-up. Whoever donated it, THANK YOU! These are the PJ's of my dreams and I can't wait to make them. I did it, I did it!! I completed my Sewlution for 2013 - to make a pair of trousers with a zip fly. Hoorah. I rule. I used the Colette Juniper pattern and even though they didn't actually take that long to make, the pattern instructions for the fly front had me completely flummoxed. How on earth they managed it on last week's Great British Sewing Bee with a rubbishy set of instructions I do not know!! The insertion of a fly front is a relatively quick and simple job, it's just getting your head around how it all fits together that's the difficult part (well it is for me anyway). Luckily, there's a photo tutorial on the Coletterie website which is a godsend if, like me, you need to see things visually in order for them to click in your head. There wasn't anything else tricky about the construction and the only change I made to the pattern was to shorten the leg length by three inches. I made a size 8, which initially seemed a bit on the tight side, until I realised that they're actually supposed to be extremely fitted around the waist and hips. My big worry was that they might be too wide in the leg, but on comparing them to my Simplicity 3688 1940's trousers and my sailor trousers, they're actually narrower in the leg than both pairs. Would you credit it?! I think it's the design that made me think they're about fifty inches wide - the legs drop straight down vertically to the floor from a very fitted waist and hip. In the end I didn't narrow the leg width, having decided that they might look a bit odd if I tried to taper them in. Fabric-wise, I used a lovely red gabardine from Calico Laine which was a delight to work with - hardly any fraying at all. As I'm short I only needed two metres, so at £5.99 a metre it was a cheapish make. I used scraps of leftover Lauren Childs Liberty fabric for the pockets which was last seen on my second Violet blouse. This worked well as Liberty Tana Lawn is a perfect weight for pocket lining. One final change I made was to add two buttons to the waistband instead of sewing on hooks and eyes. It may seem like madness to some of you, but it was actually a lot quicker and more beneficial to my mental health to make two buttonholes and sew on the buttons than it would have been to sew on some evil hooks and eyes (uurrgh). I like the way they look too - I think they add a bit of a nautical touch. "What interfacing', I hear you cry, "I can't see any." Well that's because it's RED!! Yes, red interfacing from Walthamstow market - how cool is that?! Just in case you haven't noticed, The Great British Sewing Bee is a BBC TV series entirely devoted to sewing. AT LAST!! We get to see contestants making clothes, choosing fabric, using patterns, struggling with zips and trying to get the fit right - basically everything we sewing types do all day every day, if we're lucky. Even better than that, Tilly is one of the contestants!!!!! 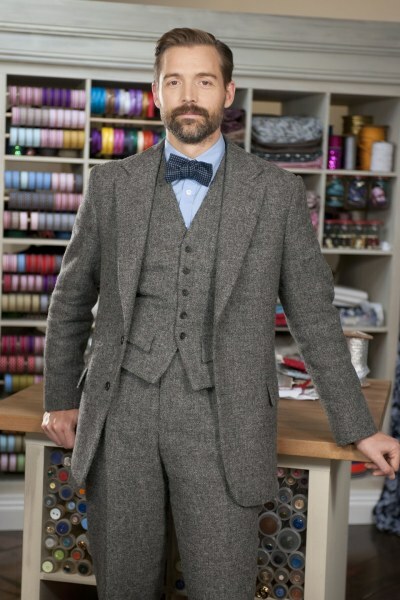 AND we get to feast our eyes on bearded Savile Row hottie Patrick Grant every week. What's not to like?! One of the aims of the programme is to encourage people to either discover or re-discover the joy of sewing your own clothes. The beautifully stylish accompanying book will certainly help you achieve both these goals. All the sections you'd expect to find in a sewing book are included: tools of the trade, different types of stitches, choosing fabric etc. 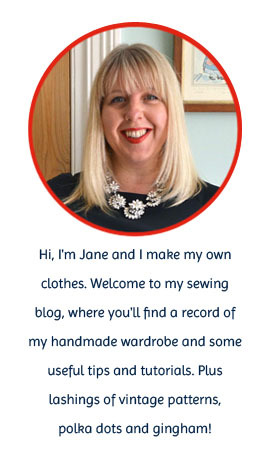 Plus a really well explained and photographed Basic Sewing Skills section, which tells you all you need to know about seams and seam finishes, gathering, zips, bias binding and buttonholes. If you're new to sewing, then reading through these pages first would be incredibly useful as they cover most techniques you're likely to find on a home sewing pattern or on one of the projects in the book. And if you've never used a pattern before, don't worry, there's a separate section on how to navigate your way around one. There were two really helpful bits that stood out for me in the book. First was a troubleshooting section on common sewing machine problems - not always included in sewing books and very handy if your machine is skipping stitches and you haven't a clue why. Second was an 'order of work' page: a template of good practice encouraging you to think about your work in a chronological order. Sounds obvious, but it's actually a really sensible way of working and an incredibly useful discipline to use for your sewing. The remainder of the book is given over to a whopping 28 projects and they really have tried to cater for all tastes and abilities. There are 11 non-clothing items including aprons, cushions and bags, plus a range of window treatments. If you like the look of the two projects featured on the telly so far (the laundry bag and the tie cushion) then they're in the book too - with detailed instructions, not the laughably brief ones that were given on the TV. The rest of the projects are all clothing items, ranging from PJ bottoms, a waistcoat and a bow tie for the gents, to a prom dress, a circle skirt and even a tailored hacking jacket for more experienced stitchers. I suppose the idea is that you can sew your way through the book, trying out more challenging projects as you gain confidence. If you wanted to take your dressmaking a step further i.e. perfect your fit, then you may have to widen your net to other resources as there are only a couple of paragraphs on adjusting patterns to get a better fit. My only gripe is that there's just the one paper pattern included with the book - for the basic tunic. All the other projects have to be either scaled up or printed out as a download and taped together. Now, I have no knowledge whatsoever of the costs involved in producing patterns to accompany a book, but I would have preferred to have seen fewer projects and more paper patterns. The time and effort required to print out and tape together just one pattern is enough to put me right off I'm afraid. But if you have a tougher constitution than me (and that's not difficult), then go for it! Two of the projects are based on commercial patterns (Simplicity 2886 and New Look 6035) and one is an early incarnation of an independent pattern - Tilly's Mathilde blouse. For all three of these garments, the instructions are pretty brief and I suspect you'd have an easier time making them if you actually bought the patterns instead. Having said that, there are some lovely classic patterns in the book that I can see being great starting points for adding your own personal touches: the tunic (see pic above), the pencil skirt and the basic dress. I wish they included a pattern for a longer version of that top, isn't it lovely? I do think it's nigh on impossible for one single book to cover every single sewing angle and taste, but The Great British Sewing Bee has had a bloody good try. Overall, it's a wonderful book and is a fabulous companion to the TV series. Tomorrow, head over to Did you Make That? where Karen will be posting her review and, rumour has it, hosting the giveaway of giveaways! And don't forget to check out the rest of the bloggers taking part in the blog tour. They are Teasemade on 9th April, Peas & Needles on 10th April, My Happy Sewing Place on 13th April and House of Pinheiro on 14th April. A copy of The Great British Sewing Bee book was given to me free of charge for review. All views my own. First things first, the winner of the Sewaholic Thurlow Pattern giveaway is annanic. Hoorah, please email me your address and I'll get the pattern out to you ASAP. Now, when she's not scaling the dizzy heights of TV superstardom in The Great British Sewing Bee (oh my god, it starts TOMORROW!!!!! ), Tilly Walnes has somehow found time to release a second pattern - the Miette skirt. I was lucky enough to be a pattern tester, which couldn't have come at a better time as I was actually contemplating making a very similar skirt this summer. This was my first time working with a Tilly-made pattern and I was particularly impressed by the instructions. Two different kinds of instructions are provided: simplified and detailed. I used the simplified instructions most of the time, apart from when it came to attaching the waistband and I decided I needed a bit of extra direction. 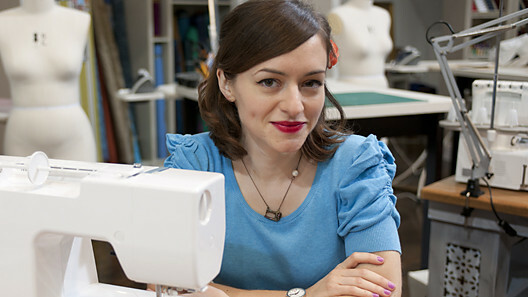 No fear on that front - Tilly has provided detailed photo tutorials of ALL the sewing stages. Having done a couple of my own tutorials for readers in the past, I know first hand how time consuming this is and take my hat off to Tilly for going the extra mile. If you're the sort of person who needs to see things visually for them to click into place, then the detailed photo instructions are a godsend. The pattern is classed as suitable for beginners and I would say that this is an accurate description. When I was first learning to sew, I scoured patterns and books in vain, looking for a simple skirt that didn't include zips or buttons. If you've been sewing for a while, then you get used to one or other of these closures in your dressmaking, but it's easy to forget just how intimidating these things are when you're a beginner. Even the simple wrap skirt I eventually found in a book included a machined buttonhole for the tie belt, which put me right off as I was terrified of using a buttonhole foot at the time! 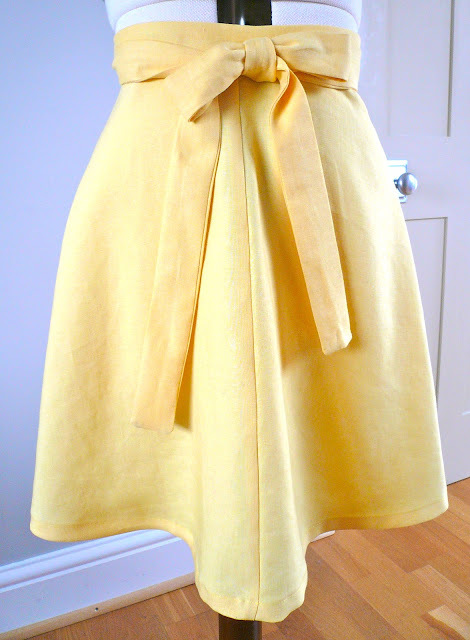 That's why I think the Miette skirt is a perfect project for a beginner. The photo instructions also provide a great safety net, which is really important if you're new to sewing. And if you're not a beginner, then you can whip one of these beauties up in an afternoon, which is how long it took me to make mine. Very satisfying. And now we come to the elephant in the room - the colour. After holding forth on my tentative liking for yellow in this post, I've finally been brave enough to venture into yellow territory. Taking the advice of my readers, I've started off with a garment that's not too close to my face, to ensure the yellow doesn't clash with my hair! I used a linen from A1 Fabric on the Goldhawk Road, which creases a bit too much for my liking, but that's linen for you. I also have to wear a slip underneath as it's a bit transparent - if I make a linen skirt again, I'll make sure I underline it! The Miette pattern was given to me free of charge for pattern testing. All views my own.